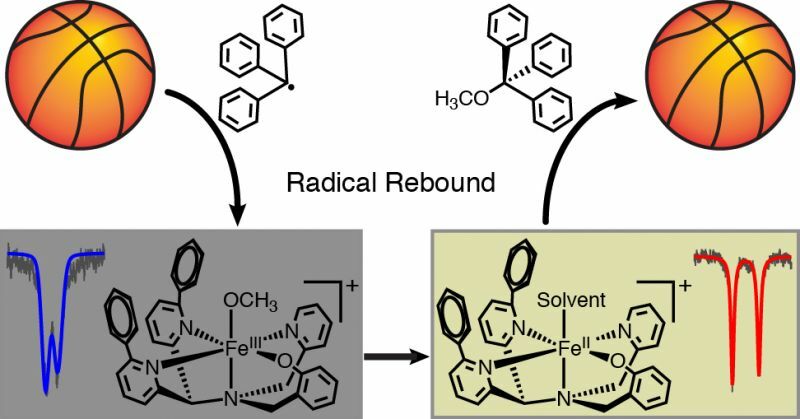 Many iron containing metallo-enzymes are proposed to react through a “rebound” mechanism whereby a radical is formed through hydrogen atom abstraction by a high-valent iron-oxo species. The radical formed then recombines with the hydroxyl radical on the iron. However, this step had not been directly observed before. By using cleverly designed small molecule models from the Goldberg lab, the international team have been able to characterise this step kinetically and spectroscopically. In particular, they have used Mössbauer spectroscopy, of which the Jameson Lab are experts, to conclusively show the change in oxidation state of the iron during the “rebound” step. The paper, titled Observation of Radical Rebound in a Mononuclear Nonheme Iron Model Complex, is available via the Journal of the American Chemical Society website.